iMovie: Create trailers or movies with photos, images, and videos. PowToon for Education: Create an animated slide presentation or video. Thinglink: Make an interactive poster. Chatterpix: Create a talking picture of yourself or another image. Sock Puppets: Create a 30 second video using sock puppets to tell the story. Timeline ReadWriteThink: Create easy timelines. WeVideo: Video editor and maker. Animoto: Make videos and photo slide shows. Photo Chop: Combine two or more images together. QR Code: Create, keep, and organize notes, lists, and photos. Glogster: Create an interactive poster. Stupeflix: Create videos. If you add it as an app to your Chromebook, you can use the camera as a video recorder. Blabberize: Make a talking picture. PicMonkey: Edit photos. Many features available to improve photos and create new ones. Sumo Paint: Online image editor. You can also use it as a drawing program. We use online. Sketchpad 3: Draw, create, share. Storybird: Read and write stories and poems. My Storybook: Write, Illustrate, and publish your own storybook online. Storyjumper: Publish your own storybook. Story Buddy 2: Create, read, and share stories. Story Me: Turn your pictures into comic strips. Toontastic: Create cartoons including all parts of a story. ABCya Word Clouds: Make a word cloud. Wordle: Make a word cloud. Tagxedo: Make a word cloud. Lego Movie Maker: Create stop motion movies. User friendly. Morfo 3D Face Booth: Turn a photo of a face into a talking, dancing, crazy 3D character. Pixton: Create comics to inspire reading and writing. My Maps - Google: Create interactive maps that you can share. You can insert images and videos. Explee: Create animated videos. You can draw as you explain. Using a green screen is an engaging tool. You can use iMovie on a Macbook to create or use other programs. Easily create green screen videos and images. Easy for learners of all ages to use. 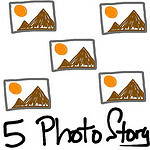 5 Photo Story: Have students summarize or retell a story in 5 slides. Explanation can be found at ​http://showwithmedia.com/.